Shop for authentic Utah Flags. We offer indoor and outdoor Utah flags in durable nylon. Our outdoor flags are finished with a canvas heading, while indoor flags are finished with a lined pole hem and your choice of with or without fringe. 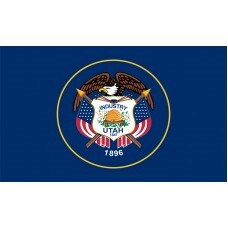 We also offer indoor and outdoor Utah flag sets. 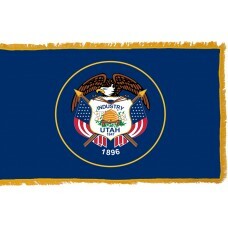 The Utah State Flag features a dark blue field with the Utah coat of arms in a golden circle. Underneath the coat of arms, "1896" is written. The coat of arms features a shield with a beehive on it. Above the beehive, the word "industry" is written and below it "1847" is written. There are sego Lillies on each side of the beehive as well as the flag of the United States of America. Above the shield is a bald eagle clutching arrows. The beehive is the official emblem of Utah and represents hard work, the word "industry" is Utah's state motto, the sego lily represents peace, and the flag of the United States of America on each side represents the support and commitment that Utah has towards the country. The bald eagle represents protection in peace and war, the arrows represent power, "1847" is the year that the Mormons came to Utah and "1896" is the year that Utah officially became a state. The Utah State flag is one of the few flags that includes the flag of the United States of America and it is thought that it was included on the state flag because the Mormons were not considered to be loyal to the United States of America. The current Utah State flag was adopted in 1913 and modified on February 16th, 2011. Utah is a state in the Western region of the United States of America. It shares borders with Idaho, Wyoming, Colorado, Arizona, Nevada, and New Mexico. The capital city is called Salt Lake City. The name Utah is derived from the word "Ute" which translates as "people of the mountains." Utah is also referred to as "The Beehive State" as it is a very important Mormon symbol and signifies industry, thrift and perseverance. Utah was inhabited for thousands of years by Native tribes such as the Shoshone, Paiute, Goshute, Navajo, and Ute. The first European to arrive to the area was Francisco Vasquez de Coronado in 1540 but the land was not claimed until 1765 when Juan Antonio de Rivera claimed it for Spain and found Colorado River. In 1847, following the murder of their leader Joseph Smith in 1844, the religious group, the Mormons, chose to move to Utah as there were not many people that lived there. Approximately 148 Mormons settled in Salt Lake Valley and named it Great Salt Lake City. One year later, 1,650 Mormons had arrived and more settlements were established which included Ogden, Provo, and Farmington. By 1850, there were approximately 11,000 Mormons in the area and they named the land the "State of Deseret." Following the Mexican-American war, the United States of America gained control of Utah and the "State of Deseret" became the "Utah Territory." Utah officially became the 45th state of the United States of America on April 1st, 1896.